Background: Periodontal disease is characterized by inflammation and destruction of supporting tissues of the affected teeth. Pro-inflammatory cytokines originating at the site of local pathology activate hepatocytes to produce acute-phase proteins including C-reactive protein (CRP). Numerous cross-sectional studies have suggested that chronic periodontitis is a risk factor for cardiovascular disease (CVD) linked by inflammatory factors including CRP. Materials and Methods: A total of forty patients, twenty with chronic periodontitis only with no CVD (Group A) and twenty with CVD and chronic periodontitis (Group B), were selected for the study. Clinical parameters including gingival index (GI), plaque index, gingival bleeding index, Pocket probing depth (PD), and clinical attachment level (CAL) were recorded. In addition, high-sensitivity CRP (hsCRP) levels were measured from the peripheral blood using turbidimetric immunoassay technique. Results: As compared to the patients in Group A, those in Group B had more severe periodontitis with greater CAL (6.02 ± 0.53 mm vs. 6.63 ± 0.85 mm, P = 0.009), probing pocket depth (PPD) (5.20 ± 0.31 mm vs. 5.73 ± 0.52 mm, P < 0.001), and GI score (2.25 ± 0.51 vs. 2.65 ± 0.76, P = 0.06). Group B patients also had significantly higher hsCRP levels (12.3 ± 8.84 mg/L vs. 2.28 ± 0.38 mg/L; P < 0.001). The hsCRP levels had a significant positive correlation with PPD and GI. Multivariate regression analysis showed that the presence of CVD was independently associated with elevated hsCRP levels in the study population. Conclusion: The present study shows that CVD is associated with more severe periodontitis which is reflected in higher hsCRP levels. In addition, elevated hsCRP showed an independent association with CVD, incremental to various periodontitis measures. These findings suggest that periodontitis may add to the inflammation burden of the individual, which may potentially increase inflammatory activity in atherosclerotic lesions and thus the risk for cardiovascular events. CRP was discovered in Tillett and Francis laboratory in 1930 during the course of study of patients with Streptococcus pneumonia infection. Pro-inflammatory cytokines originating at the site of local pathology activate hepatocytes to produce acute-phase proteins including CRP. CRP is an acute-phase reactant plasma protein produced in response to diverse inflammatory stimuli. It binds to phosphocholine, phospholipids, plasma lipoproteins, and the plasma membranes of damaged or apoptotic but not intact cells. Ligand-bound CRP activates the classical complement pathway 1 and can trigger inflammatory, opsonizing, and complex solubilizing activities of the complement system. CRP levels reflect the extent and activity of disease. , In humans, plasma levels of CRP may rise rapidly and markedly, as much as 1000-fold or more, after an acute inflammatory stimulus, largely reflecting increased synthesis by hepatocytes. The acute-phase reaction represents an early, nonspecific, and highly complex reaction of the organism to a variety of injuries such as bacterial, viral or parasitic infection, and ischemic necrosis. CRP in plasma is normally present in low levels (<0.3 mg/dl) but may increase dramatically to hundreds of micrograms per milliliter within 72 h of tissue injury. The amount decreases with the subsidence of the disease process and the recovery of the patient. Therefore, a cross-sectional study was carried out using high-sensitivity CRP (hsCRP) as a potential marker for the assessment of relationship between chronic periodontitis and CVD. The aim of the study was to compare and evaluate the systemic levels of hsCRP in patients of chronic periodontitis with and without CVD and to assess the relationship among hsCRP levels, periodontal clinical parameters, and the presence of CVD. The study included forty patients of age group 30-65 years, diagnosed with chronic periodontitis alone (Group A, n = 20) or with chronic periodontitis and CVD (Group B, n = 20). The Group A patients were recruited from the Dental Clinic of our hospital whereas the Group B patients were those admitted for the treatment of CVD at our hospital and were subsequently found to have periodontitis. Both males and females, having a minimum of twenty teeth, were eligible for inclusion in this study. Patients having any form of systemic disease (apart from CVD in Group B) and/or history of any periodontal surgery in the past 6 months were excluded from the study. Patients were also excluded if they had any of the following conditions: pregnant and lactating females, smokers, use of any antibiotic or anti-inflammatory medication in the past 6 months, any history of trauma or recent tooth extractions, any other systemic infection, and unwillingness to participate in the study. All the patients were informed about the purpose of the study prior to participation. A consent form, duly signed by each patient, was obtained. Ethical Committee clearance was obtained from the Institutional Ethical Committee. Periodontal disease status was determined using clinical and radiographic criteria. The following parameters were measured: gingival index (GI), plaque index (PI), gingival bleeding index (GBI), probing depth (PD, in mm), clinical attachment level (CAL, in mm), and radiographic alveolar bone loss (ABL). All patients included in the study (Groups A and B both) had chronic generalized periodontitis with marked redness, edema, and tendency of bleeding on probing, at least 8 teeth with PD ≥5 mm, at least eight teeth with CAL ≥5 mm, and radiographic evidence of ABL. All patients also had measurement of high-sensitivity CRP (hsCRP) levels. A volume of 5 ml of peripheral blood was collected from the patients by venipuncture in the antecubital fossa using tubes with ethylenediaminetetraacetic acid and was immediately sent for centrifugation at 2000 rpm for 5 min. Serum was separated carefully from the centrifuged sample and then stored in a freezer until further analysis. Serum concentrations of hsCRP were quantified using a commercially available particle-enhanced turbidimetric immunoassay (Transasia Bio-Medicals Ltd., Erba Diagnostics, Mannheim, Germany). Mean, standard deviation, and standard error of mean were calculated for all the clinical parameters and hsCRP levels. Mean data were analyzed by standard statistical method. The parameters were compared between groups using one-way analysis of variance. Karl Pearson's correlation coefficient test was used to measure the correlation of two indices with each other in each group. Multivariate regression analysis was performed to determine independent predictors of hsCRP in the study population. The analysis was performed by the data analysis software through Microsoft Excel 2003 and Statistical software (Statistical Package for Social Sciences or SPSS version 16 SPSS Inc., Chicago, IL, USA). P < 0.05 was considered statistically significant. There was no significant difference between the two groups in age (Group A - 51.9 ± 1.9 years; Group B - 54.3 ± 1.87 years, P not significant) or gender distribution (Group A - 12 men, Group B - 11 men, P not significant). As compared to the patients in Group A, those in Group B had generally more severe periodontitis with greater/more severe CAL (6.02 ± 0.53 mm vs. 6.63 ± 0.85 mm), probing pocket depth (PPD) (5.20 ± 0.31 mm vs. 5.73 ± 0.52 mm), PI score (1.89 ± 0.35 vs. 1.92 ± 1.10), GBI score (81.62 ± 10.4 vs. 83.7 ± 28.0), and GI score (2.25 ± 0.51 vs. 2.65 ± 0.76) [Table 1] and [Figure 1]. However, the difference was statistically significant only for CAL (P = 0.009) and PPD (P < 0.001) with borderline significant difference for GI (P = 0.06). Patients in Group B also had significantly higher hsCRP level (12.3 ± 8.84 mg/L) as compared to the patients in Group A (2.28 ± 0.38 mg/L; P < 0.001) [Table 1] and [Figure 1]. 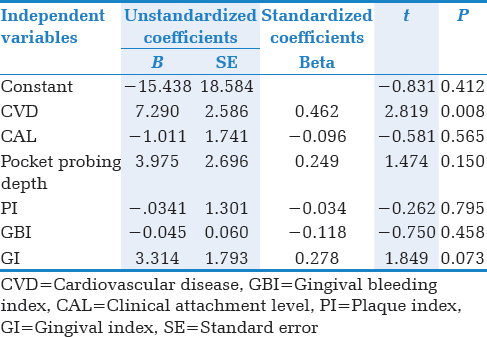 The hsCRP levels had a significant positive correlation with PPD (correlation coefficient: 0.53, P < 0.001) and GI (correlation coefficient: 0.42, P = 0.006) but not with other periodontitis measurements [Table 2]. Multivariate regression analysis was performed using hsCRP as the independent parameter and the presence of CVD and various periodontitis markers as dependent parameters. The presence of CVD was found to have the strongest association with hsCRP levels in the study population [Table 3]. However, a reduction in the oral infectious burden can result in a reduction in the overall inflammatory load, with positive effects demonstrated on surrogate measures of atherosclerosis as evidenced by meta-analyses. , Gordon Douglass, President of American Academy of Periodontology, had stated that "I foresee patients receiving routine CRP testing in their dentist or periodontist's office in the near future." This could help early diagnosis of disease sooner rather than later, as patients visit their dentist or periodontist at least twice a year. Our study had certain limitations that merit attention. The most important limitation was the small sample size, which compromised the robustness of our data. However, the present study was only a pilot study, conducted with an objective to gain insights into the relationship between periodontitis, systemic inflammation, and CVD in our study. In addition, we could not assess the relationship of hsCRP levels with various CVD risk factors and other predictors of CVD. The impact of treatment on hsCRP levels and their relationship with CVD status could also not be studied due to the cross-sectional nature of the present study. The present study shows that CVD is associated with more severe periodontitis which is reflected in higher hsCRP levels. In addition, elevated hsCRP showed an independent association with CVD, incremental to various periodontitis measures. These findings suggest that periodontitis may add to the inflammation burden of the individual, which may potentially increase inflammatory activity in atherosclerotic lesions and thus the risk for cardiovascular events. Loos BG, Craandijk J, Hoek FJ, Wertheim-van Dillen PM, van der Velden U. Elevation of systemic markers related to cardiovascular diseases in the peripheral blood of periodontitis patients. J Periodontol 2000;71:1528-34. Gani DK, Lakshmi D, Krishnan R, Emmadi P. Evaluation of C-reactive protein and interleukin-6 in the peripheral blood of patients with chronic periodontitis. J Indian Soc Periodontol 2009;13:69-74. Cybulsky MI, Jongstra-Bilen J. Resident intimal dendritic cells and the initiation of atherosclerosis. Curr Opin Lipidol 2010;21:397-403. Tillett WS, Francis T. Serological reactions in pneumonia with a non-protein somatic fraction of pneumococcus. J Exp Med 1930;52:561-71. Medzhitov R. Recognition of microorganisms and activation of the immune response. Nature 2007;449:819-26. 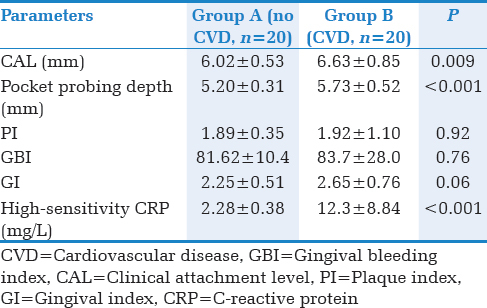 Tüter G, Kurtis B, Serdar M. Evaluation of gingival crevicular fluid and serum levels of high-sensitivity C-reactive protein in chronic periodontitis patients with or without coronary artery disease. J Periodontol 2007;78:2319-24. Shine B, de Beer FC, Pepys MB. Solid phase radioimmunoassays for human C-reactive protein. Clin Chim Acta 1981;117:13-23. D′Aiuto F, Parkar M, Andreou G, Suvan J, Brett PM, Ready D, et al. Periodontitis and systemic inflammation: Control of the local infection is associated with a reduction in serum inflammatory markers. J Dent Res 2004;83:156-60. Black S, Kushner I, Samols D. C-reactive protein. J Biol Chem 2004;279:48487-90. Ebersole JL, Cappelli D. Acute-phase reactants in infections and inflammatory diseases. Periodontol 2000 2000;23:19-49. Bokhari SA, Khan AA, Leung WK, Wajid G. Association of periodontal and cardiovascular diseases: South-Asian studies 2001-2012. J Indian Soc Periodontol 2015;19:495-500. Rose LF, Genco RJ, Cohen DW, Mealey BL. Periodontal Medicine. Hamilton: B.C. Decker Inc.; 2000. Beck JD, Offenbacher S. Systemic effects of periodontitis: Epidemiology of periodontal disease and cardiovascular disease. J Periodontol 2005;76 11 Suppl: 2089-100. Kinane DF. Periodontal diseases′ contributions to cardiovascular disease: An overview of potential mechanisms. Ann Periodontol 1998;3:142-50. Ridker PM, Cushman M, Stampfer MJ, Tracy RP, Hennekens CH. Plasma concentration of C-reactive protein and risk of developing peripheral vascular disease. Circulation 1998;97:425-8.
de Maat MP, Kluft C. Determinants of C-reactive protein concentration in blood. Ital Heart J 2001;2:189-95. Haraszthy VI, Zambon JJ, Trevisan M, Zeid M, Genco RJ. Identification of periodontal pathogens in atheromatous plaques. J Periodontol 2000;71:1554-60. Bansal T, Dhruvakumar D, Pandey A. Comparative evaluation of C-reactive protein in peripheral blood of patients with healthy gingiva, gingivitis and chronic periodontitis: A clinical and particle-enhanced turbidimetric immuno-analysis. J Indian Soc Periodontol 2014;18:739-43. Wu T, Trevisan M, Genco RJ, Falkner KL, Dorn JP, Sempos CT. Examination of the relation between periodontal health status and cardiovascular risk factors: Serum total and high density lipoprotein cholesterol, C-reactive protein, and plasma fibrinogen. Am J Epidemiol 2000;151:273-82. Paraskevas S, Huizinga JD, Loos BG. A systematic review and meta-analyses on C-reactive protein in relation to periodontitis. J Clin Periodontol 2008;35:277-90. Linden GJ, McClean K, Young I, Evans A, Kee F. Persistently raised C-reactive protein levels are associated with advanced periodontal disease. J Clin Periodontol 2008;35:741-7. Bergström J, Preber H. Tobacco use as a risk factor. J Periodontol 1994;65 5 Suppl: 545-50. Luoto R, Pekkanen J, Uutela A, Tuomilehto J. Cardiovascular risks and socioeconomic status: Differences between men and women in Finland. J Epidemiol Community Health 1994;48:348-54. Armitage GC. Periodontal infections and cardiovascular disease - How strong is the association? Oral Dis 2000;6:335-50. Tonetti MS, Van Dyke TE; Working Group of the Joint EFP/AAP Workshop. Periodontitis and atherosclerotic cardiovascular disease: Consensus report of the Joint EFP/AAP Workshop on Periodontitis and Systemic Diseases. J Periodontol 2013;84 4 Suppl: S24-9. Ebersole JL, Machen RL, Steffen MJ, Willmann DE. Systemic acute-phase reactants, C-reactive protein and haptoglobin, in adult periodontitis. Clin Exp Immunol 1997;107:347-52. Saito T, Murakami M, Shimazaki Y, Oobayashi K, Matsumoto S, Koga T. Association between alveolar bone loss and elevated serum C-reactive protein in Japanese men. J Periodontol 2003;74:1741-6. Buhlin K, Gustafsson A, Pockley AG, Frostegård J, Klinge B. Risk factors for cardiovascular disease in patients with periodontitis. Eur Heart J 2003;24:2099-107. D′Aiuto F, Orlandi M, Gunsolley JC. Evidence that periodontal treatment improves biomarkers and CVD outcomes. J Clin Periodontol 2013;40 Suppl 14:S85-105. Teeuw WJ, Slot DE, Susanto H, Gerdes VE, Abbas F, D′Aiuto F, et al. Treatment of periodontitis improves the atherosclerotic profile: A systematic review and meta-analysis. J Clin Periodontol 2014;41:70-9.